The UK market is smaller, of course, but is also growing strongly. The IABUK reported at the beginning of October that online advertising sales for the first half of 2006 approached £1bn, at £971m. The 40.3% year-on-year growth meant that online ads in the UK now represent 10,5% of the advertising market, and is considerably larger than the radio, outdoor and consumer magazines sectors, and is approaching the share taken by national newspapers (11.4%). 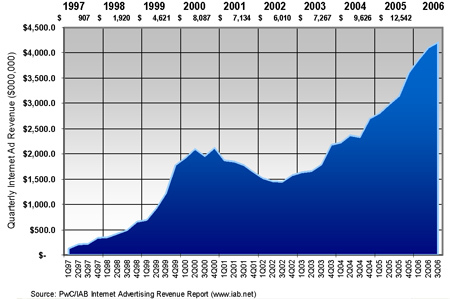 In fact, while online ads showed strong growth, TV, press, radio and direct mail all declined in the same period. 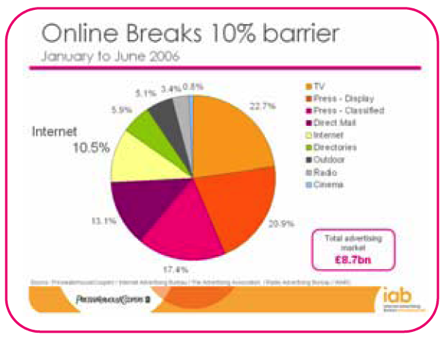 IABUK anticipated that online would overtake national newspapers by the end of 2006. I was pleased to see that spending on interruptive formats, including pop-ups, is declining and now represents 0.7% of all online ads. Somehow the annoyance factor remains substantially higher than 0.7% – possibly because some substantial users of pop-ups don’t report statistics to the IAB?